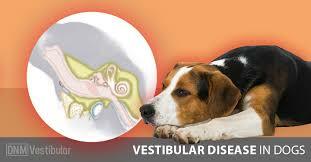 Vestibular system aids in providing equilibrium and a sense of spatial orientation to dogs. But a dysfunction can have serious effects on the balance systems of the dog's body. This system includes the parts of the inner ear and brain, which are responsible for the balance and eye movements. If the network is damaged by illness, aging, or injury, serious disorders can result, and are often associated with one or more of these signs, among others: Vertigo and dizziness. The first one is less common but more serious form of this disease that originates inside the central nervous system. The second type of this disease happens when there is annoyance to the nerves connecting the inner ear with the brain. This results in failure of balance and other symptoms resulting in vertigo and dizziness. This illness can look to be quite melodramatic to the dog owner if this is the first time the dog has been affected. But most of the times the dog recovers with supportive care and treatment. Congenital Vestibular disease is seen between birth and three months of age. Certain dogs are more predisposed to this condition, including Doberman Pinschers, English Cocker Spaniel, Beagle, German shepherd, Tibetan terrier and Smooth Fox Terrier. This disorder is often mistaken as a stroke. The vertigo originated by this disease has an adverse effect on older dogs having symptoms like difficulty to stand up, circling, nystagmus, nausea, and head tilt. Older dogs are more stressed out due to this disease and so there is a need reduce their stress through earthy calming agents like amino acid, L-theanine and herbs including hops, Valerian, chamomile, and passionflower. Other remedies, including GABA, flower essences, tryptophan, and Homeopathic are also good in calming overwhelmed dogs. The veterinarian would conduct a physical examination to determine whether the disorder is peripheral or central. In case, a peripheral form of the condition is found, the veterinarian would use an otoscope to look deep into the ears of the pet. There are times when X-rays would be required. The veterinarian would also take the aid of blood tests, culture, sensitivity and cytology to get rid of other likely causes of specific symptoms. For tumors and polyps your veterinarian would propose a surgical biopsy. In case the central Vestibular disease is determined, the veterinarian would use an MRI or CT scan along with spinal fluid taps to find the root cause. If it is due to infection, then it has to be resolved. It is possible to alleviate nausea and vomiting with motion sickness treatments, but there is no specific treatment to manage Congenital Vestibular Disease. For middle or inner ear infection, antibiotics might be required to improve the condition. In case an under-active thyroid is the reason, the disorder will get resolved when the metabolic condition is managed precisely. If the treatment is the root cause then discontinuing the treatment can bring about complete resolution. But there are times when there can be some residual hearing failure. To completely cure this situation, the veterinarian would remove the polyps, but if there are cancerous tumors, then the conclusion is generally less positive. This disease has a poor prognosis than peripheral form as a result of potential dangers to the brain stem that can be quite devastating. If there is an infection found, it has to be treated. In case of an inflammatory condition, it may react to treatment at first, but it can advance to a point where it could be untreatable. But the most common form of Vestibular disease - the peripheral form - improves swiftly, once the inherent cause is addressed and symptoms of vertigo are managed with supportive care.